At 8 in the morning we were supposed to go to the Nyambudi family for breakfast. Gösta was going to come and pick up Bernt, Yapeco and me, but we didn´t leave until after 9. The cause of the delay was a traffic accident; a bus had run over and killed a young boy. We rescheduled and decided to go to Nzo Binati first to see Edi Diafuanakana. His wanted to discuss the installation of a new generator in Luozi with Gösta. I gave him a few letters from Sweden and we exchanged some thoughts about the church truck, the Scania, which is now working. Bernt told him that we have collected enough money to buy a new engine. We also told him that we think it´s best that the church sells the truck to an entrepreneur. We continued to the Nyambudis, a drive of about an hour. After a heartfelt reception, we had a somewhat delayed breakfast. 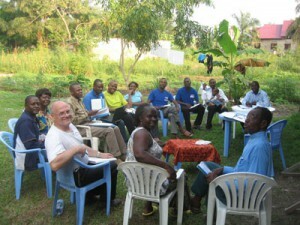 Ten prospective entrepreneurs and farmers sat waiting for us. They had probably been waiting for a couple of hours, but it didn´t seem to be a problem for them. There is plenty of time in Kongo. The whole Nyambudi family; dad Jean Clement, mom Julienne, daughters Nina, Zola, Emma and son Tutondele were gathered. The house has a very spartan appearance. The walls are made of grey, unplastered cement bricks, the roof of corrugated iron with no ceiling. There is running water, a toilet and electricity indoors, but the meals are cooked outside over an open fire. They have a bucket shower and sleep on mattresses on the floor under mosquito nets. The furniture consists of a sofa and armchairs, a TV, a few plastic tables and chairs for everyone. But the house is filled with so much human warmth, and is situated in such a beautiful, green and quiet neighborhood, surrounded by farmlands not far from the Congo river. On the other side of the river, you can see Brazzaville. We started the entrepreneurial course in the living room. First, Clement spoke a few, very appreciative words in both Swedish and French. He said that the entrepreneurial course is a new form of missions. To hear this from a former director of the church was very gratifying for us. Julienne took over and said a long prayer for the project. Then, Bernt and I started talking about entrepreneurship. Suddenly we heard a violent explosion. And we kept hearing new explosions a few times during the day. The origin of the noise was the blasting of rocks and stones not far away from the house. At 2 pm we had dinner consisting of chicken, rice (potatoes for us white people), manioc and boiled manioc leafs. For desert, which was served exclusively for Bernt and me, we had coffee and muffins. After dinner, everybody got to tell a little about themselves. It seems to be a first-rate group, almost all of them have university studies on their CV’s and most of them speak English. The average age of the group members is 35. All of them are employed, but they want to invest their time and energy in something new. We believe that the group members have ambitions and a desire to change their situation. We course continued until 5 pm. Then, Julianne gathered the entrepreneurs in a discussion about the lease, and the conditions we had suggested. By 6 o´clock we headed for the hotel, but we had a somewhat laborious journey back. On two occasions we had to make a detour, and the distance of 30 kilometers between the Nyambudis and the hotel took us almost three hours. There was chaos on the roads virtually everywhere. With a temperature of 25-30ºC and the exhaust fumes from all the crowding cars, Bernt and I got nauseous and our eyes hurt. Luckily we survived and Yapeco got us some buns, cheese and water back at the hotel. After the light meal, we went straight to bed and fell asleep at once. Je suis vraiment ravi de joie de contempler les œuvres réalisées par le pasteur (ex président) Nyambudi et son épouse. Prof. Dr Damien KUDADA BANZA/Bruxelles/Belgique.